Today I am sharing the pictures of our basement half bathroom addition that we completed during the Spring 2016 One Room Challenge. And here we go with some pictures! 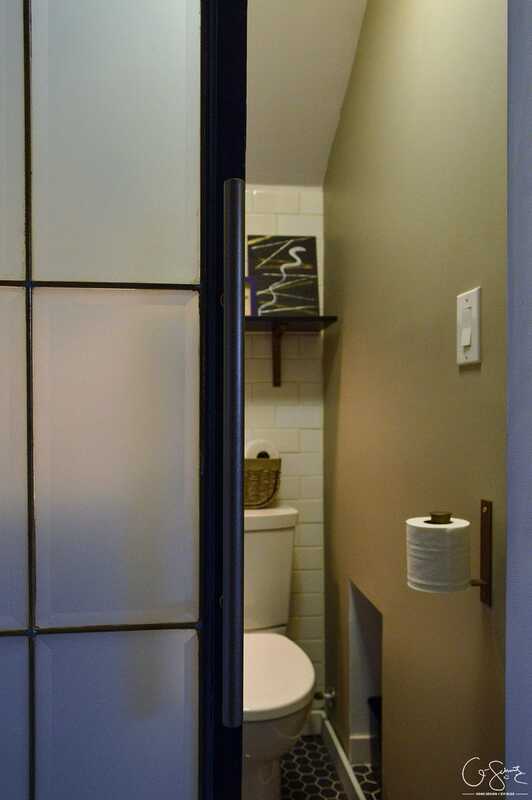 You open the DIY black frosted sliding door (with antique brass) which was the main design basis for the room. I added a painted antique brass pull to the door, and it matches all the accessories in the room too (tune in next week for details on those!). If we compare the bathroom with the original design mockup from Week 1, we’re pretty close! 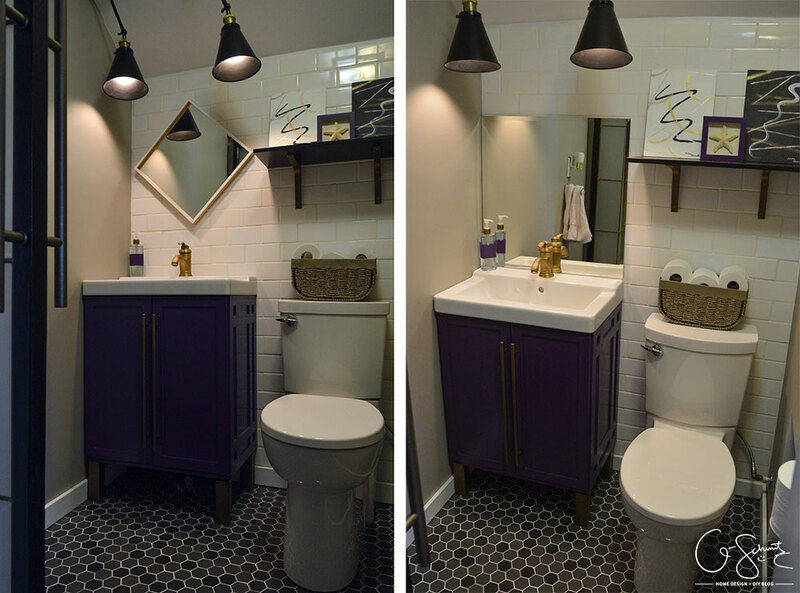 I mentioned then that the Husband didn’t want purple penny tiles, so we swapped the black vanity for a custom purple one and made the floors black instead. I didn’t need a lot of storage in this bathroom, since we have a large/main one upstairs so I only have one shelf setup with some decor. This space will be used just for its intended purposes (you know, peeing) and I wanted to keep it as clutter-free (visually and actually) as possible. In case you didn’t follow along with our progress throughout the last six weeks, I made this little animation to show how far the space has come. What used to be my paint storage area under the staircase in our unfinished laundry room, has now become a lovely modern bathroom! 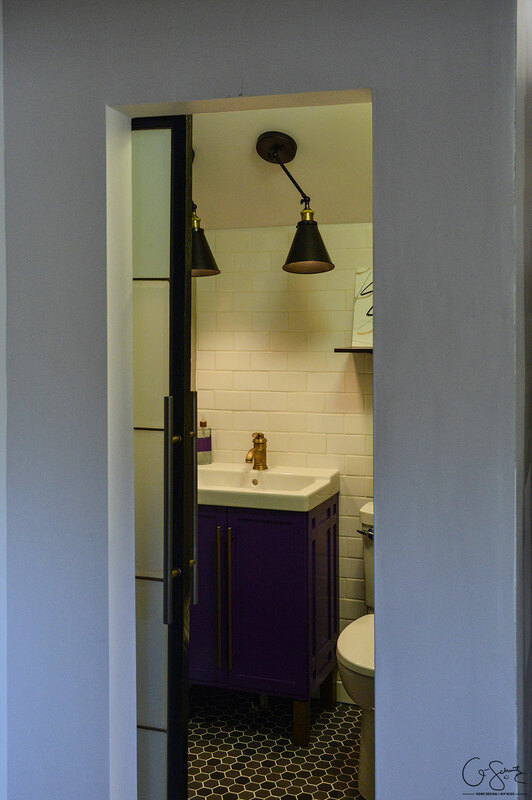 I managed to incorporate lots of purple and antique brass accents throughout the little room. And, as I mentioned before, next week I’ll be going into bigger detail about all the accessories I brought in, and how I was able to customize them all to match the design of the bathroom. Those are actually two abstract paintings I did in high-school and found in my bedroom back home. 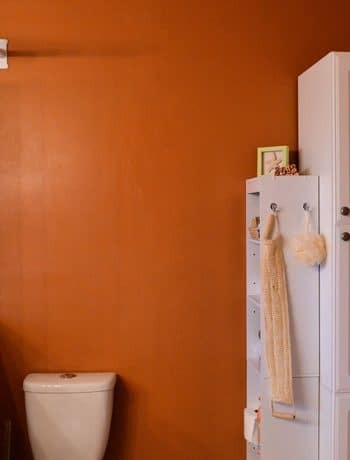 I really wanted a concealed trapway toilet, because it seems like it would be much easier to clean (less nooks and crannies for dust) and it also doesn’t have any hiding spots for wayward spiders that could come around! I also like to have rolls of toilet paper that are visible in my bathrooms, that way guests aren’t stuck looking in the cabinets if the main roll runs out. 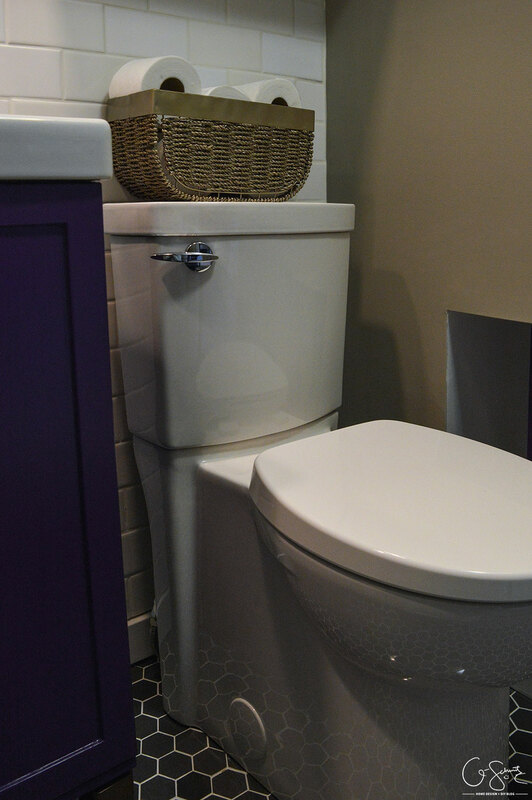 Speaking of guests… you know what else I’ll always include in an easy-to-find spot in the bathroom? A plunger! We have ours (and a toilet brush) in a little cubby that we framed out in week 2. 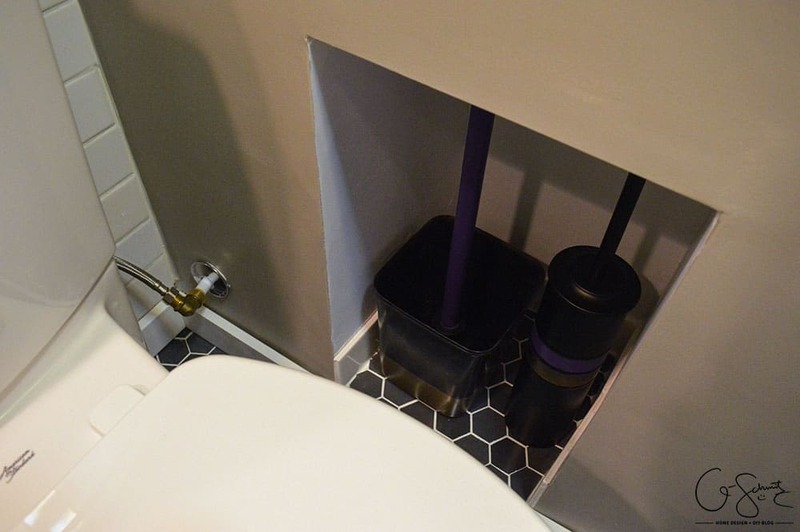 I also tiled the bottom of the cubby to match the floors, and obviously the plunger and toilet brush got some added paint to match the decor. Here’s what the space looks like with both mirror options. The one on the left is smaller, and would be hung at a diagonal like shown; and the one on the right would be hung a bit higher (but I ran out of duct tape). I didn’t want to actually drill holes into the wall until I figured out which one we were going with. So far, looks like the diagonal one is winning! We aren’t done the room 100%, because once we installed the door, I realized that I would probably like to hide the hardware/trim piece. I was originally planning on doing a pocket door in the wall… but you-know-who vetoed that idea and wanted to go with a sliding one. Anddddd that meant that the gorgeous antique brass lock I bought would be useless… so now I don’t think the door will have a lock (how do you even lock a sliding door!?). 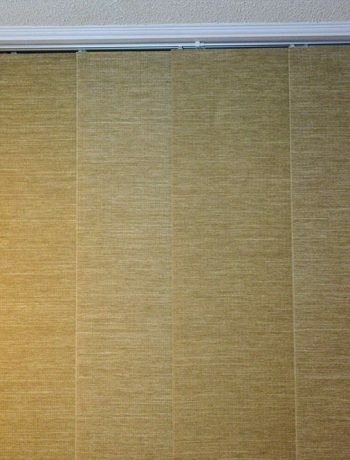 And of course, the whole mirror debacle needs to be settled, but for now it’s just a blank wall. 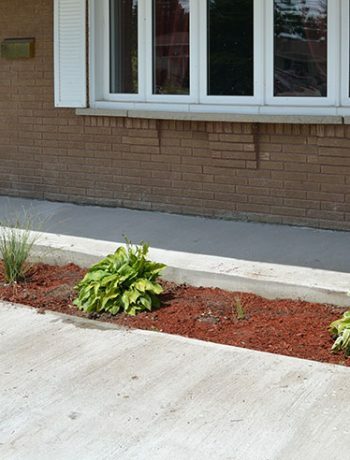 The outside of the bathroom needs to also be addressed, but that’s something we’ll do way in the future when we tackle the rest of our basement plans. Considering we built this room from scratch in less than two months is crazy! Here is another little animation showing that outside wall, and if you come back and visit me, we might get around to finishing this wall within the next year haha! 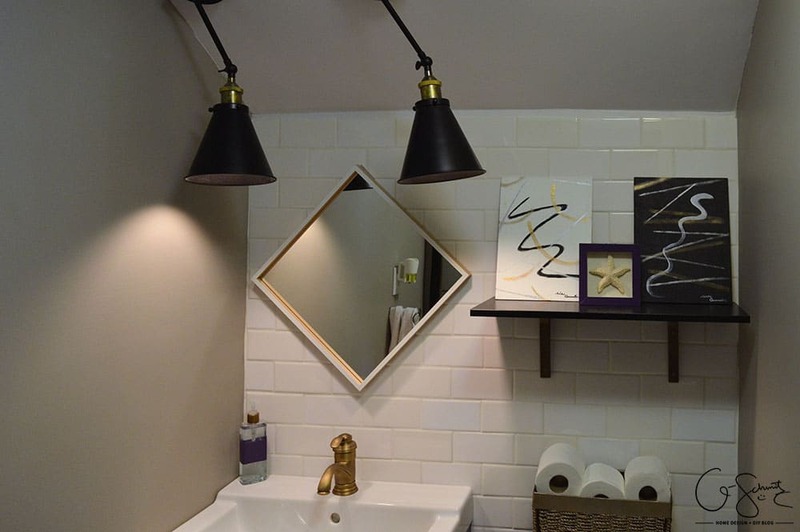 Accessories – you’ll have to stop in next week for the detailed list (and see how I was able to customize them all to match this bathroom)! And if you’ll excuse me for the next few days, I’m off to check out the reveals of all the One Room Challenge featured designers, and then all the linking participants! that turned it out really well. Love the purple touch and mirror. Look forward to seeing it next time I’m in town. It’s a super nice space and I’m almost scared to get it too dirty! Omg Nicole, it looks AMAZING! <3 I legit love every bit of it! It all works so great together!! Thanks Kyla! It’s the most “modern” style room in our house, and I really like it too! Either mirror would work, and I have a space for where the other one would go anyways. I’m not sure if baby will be here on June 10th (I hear the first one is always later) but I’m hoping all my projects are done by the end of May at least! I love the black floor tile, great job! This bath is way too nice to. Be hidden in the basement! 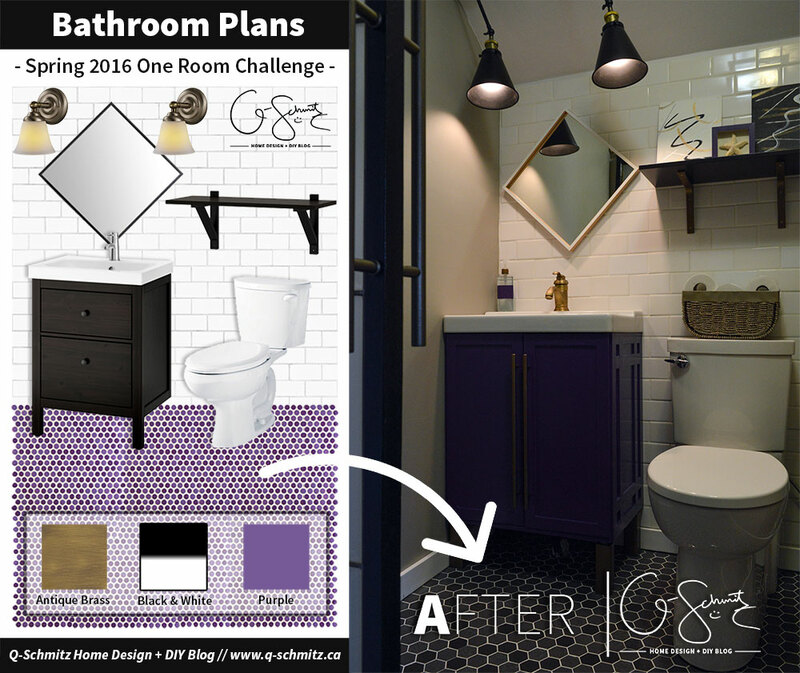 Nicole – your half bath transformation is fabulous. 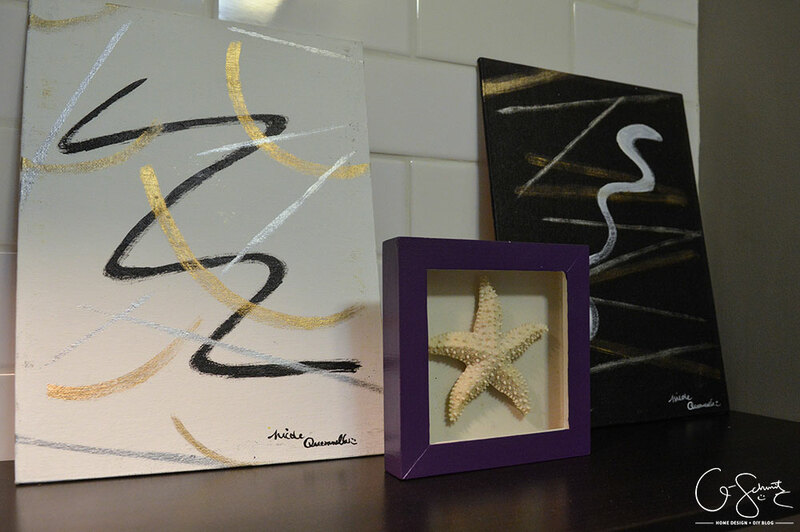 We love your bold color choices and finishes. I love bright colours the most, and since I was going more “neutral” with the tiles and walls, I figured I needed something to brighten the space! It looks amazing!!!! Purple and antique brass are a beautiful combination!! And I can’t believe you did this all in such a short time! Ha, the Husband definitely thought I was crazy the past little while – at least I had the design figured out ahead of time (because that probably took the longest to nail down!). Technically we did cheat with gutting it/cleaning it out before the 6 weeks started – but it was nice to have a deadline to push us to complete everything. Thankfully the room is little! You truly packed in a lot of great punches on such a tiny space Nicole! 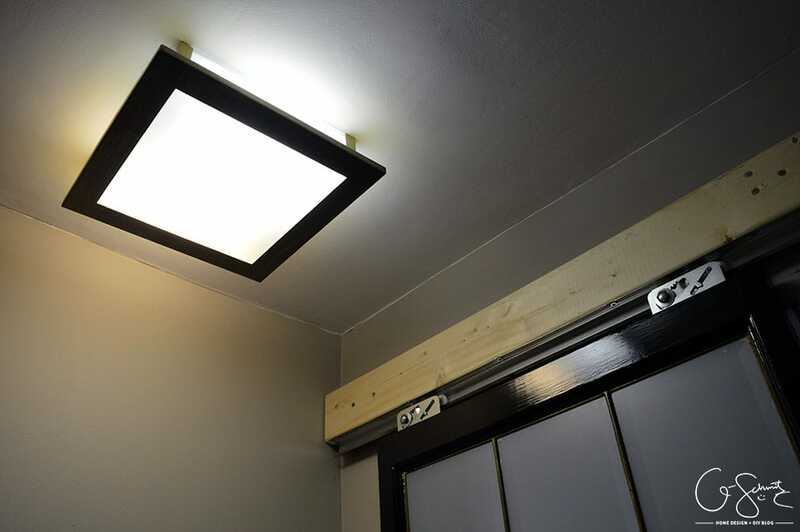 LOVE how you maximized its full potential and added those snazzy lighting! Fabulous!Congrats and CHEERS to us for another room done! It’s so impressive that you built this bathroom from basically nothing. The finishes you selected are gorgeous and I’m glad you were able to get some of your purple in the room, even if it wasn’t the tile. Well done and get some rest–you’ve earned it! Thanks for the support :) I’ll rest when the baby is here… hahaha ya right! Truly terrific job! You really made the most of the space. 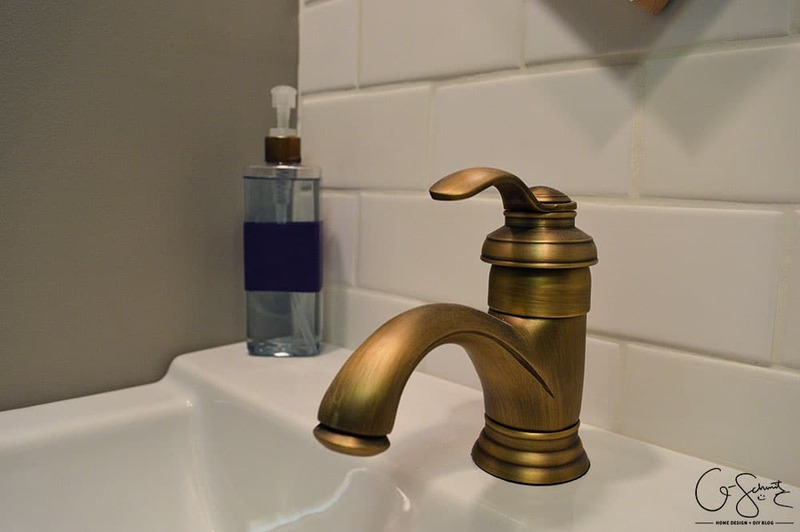 I adore the vanity and touches of brass. Have a wonderful flower filled week! This is so cool! I can’t believe you completely gutted a bathroom and got it finished in time. The brass touches are beautiful! The Husband definitely thought my timeline was pushing it, and technically we do have a few more small details to finish, but it’s a usable bathroom and that’s all that matters! Beautiful job Nicole! I love how funky and gorgeous the materials and colors you chose for this space are. Awesome design! Pinning. 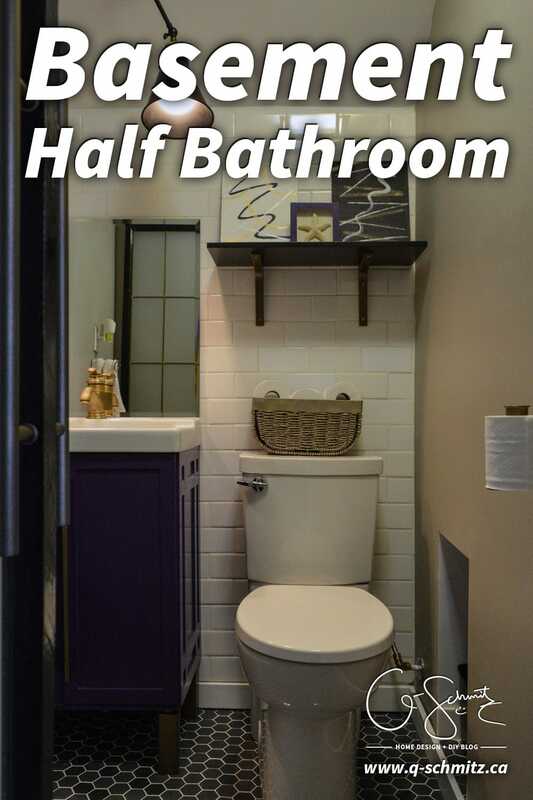 Nicole, this is quite an accomplishment – you went from a big empty space with nothing to a fully functional bathroom in just six weeks – and it’s gorgeous! Nice job! 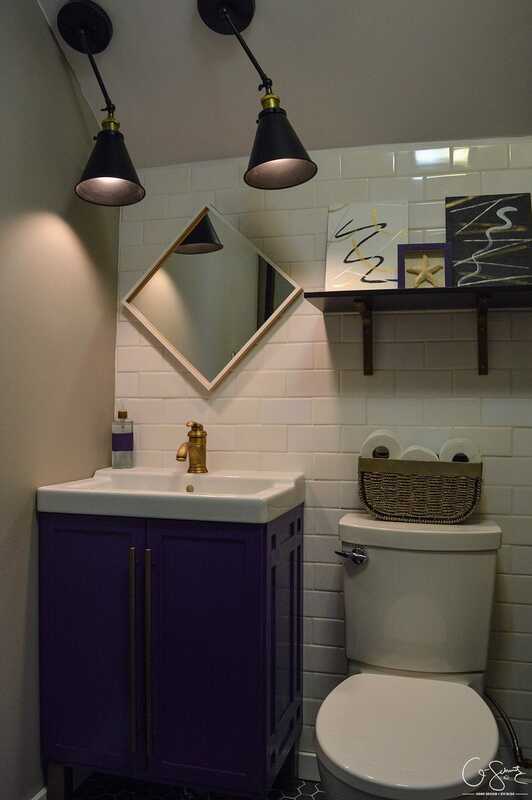 Love the purple vanity and the diamond mirror. That sliding door looks fantastic too. You’ll have to let us know if/when you ever figure out a way that guests can lock it! This turned out sooo great! I LOVE the ikea vanity hack, that trim on the side and the pulls are so nice! And I still love the wall cubby. Great job, I bet you are so happy to be done with this new space!! So happy to be able to use this bathroom (we recently moved our desks/office downstairs, so it is very convenient). Hoping to do all the last minute finishes this weekend!